These products are made with the same premium ingredients and recipes as our Fresh Line, but these sandwiches do not include lettuce and tomato. Our 21-day shelf life is shorter than the industry standard to ensure freshness. 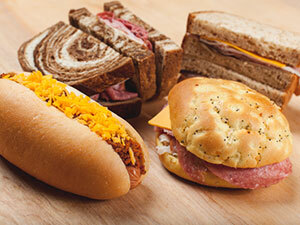 Modified atmosphere packaging allows sandwiches to stay fresh without ever being frozen. These products have a five to seven day shelf life and include sandwiches, salads, fruit cups, veggie trays and parfait cups. All sandwiches are topped with lettuce and tomato unless specified. This line features premium packaging that does not compromise the product quality and attracts customers’ attention at the same time. We partner with brands that share our vision for producing quality convenience foods. These offerings are updated regularly. Western’s Smokehouse, based in Greentop, MO, is a family-owned and operated company. They specialize in premium, one-of-a-kind snack sticks. We have partnered with Western’s to distribute their new, healthier line in four flavors: Original Grass Fed Beef, Barbeque & Pineapple Pork, Buffalo Wing Flavor Chicken, and Sriracha Turkey. All of these snack sticks use proteins with no added antibiotics or hormones. These products are made without nitrites and are gluten free, MSG free, and soy free. Western’s Snack Sticks are available by the box. Each box contains 12 units. R.U. Nuts Company, based out of Lincoln, Neb, has been in business for over 20 years. 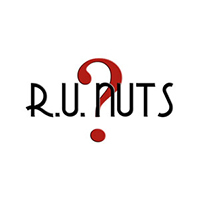 We have partnered with R.U. Nuts to distribute their line of nut and trail mixes in three different sizes: snackers (single serve), snack packs, and standup pouches. All sizes are available by the each or case. 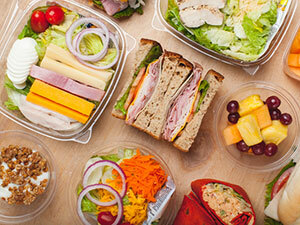 Contact us at 402.597.1623 or info@lunchboxfoods.com for a full R.U. Nuts Snack Line Product List.